Angels, celestial creatures, figure prominently in many of the world’s religions. Christianity inherited its devotion to angels from the Jewish faith from which it emerged. All the orders were considered to be attendant on God and continually sang his praises. It became common in medieval art to show angels singing or playing musical instruments in adoration of God. 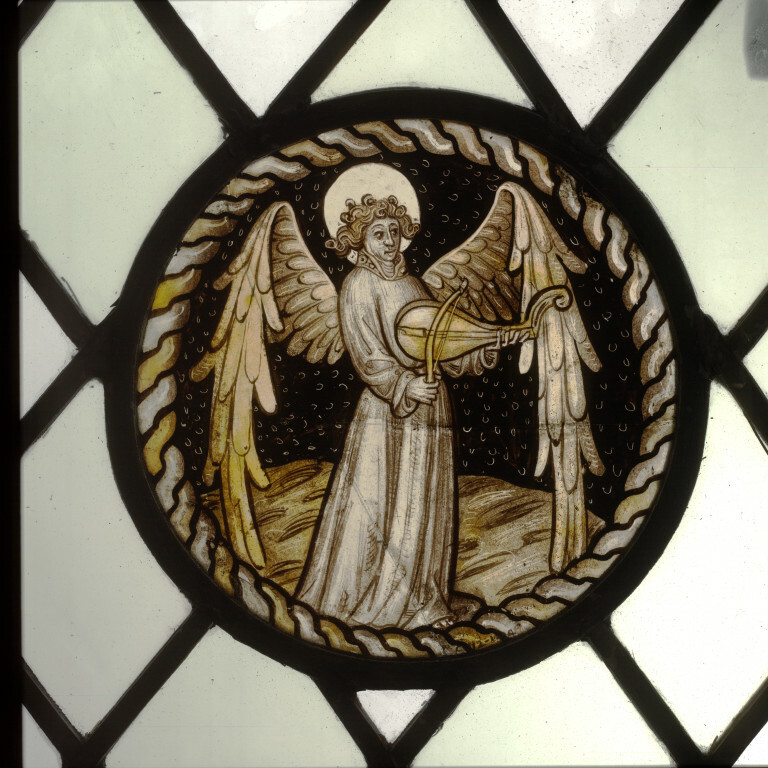 The angel in this roundel is playing a rebec, an early form of the violin. The instrument was known in England as early as the 11th century. The musician would rest it on the shoulder or across the chest, as depicted here. Roundel of clear glass with painted details and yellow (silver) stain. An angel with wide and long extended wings stands centrally in the roundel. He is playing a rebec. He wears what appears to be an alb and a low-fastening embroidered amice around his neck. He stands on a grassy field. The background is overpainted in brown/black pigment, through which barbs are scratched out. The whole is encased in a alternating white and yellow cable border. The original location of the roundels is not known but their size and type suggest that they were set in a simple trellis or quarry pattern in a window of a private chapel or oratory. They were removed from the now-demolished Hardwick House near Bury St Edmunds, Suffolk, in 1924. Hardwick House had been the property of the late Sir Thomas Cullum and his descendents. Roundel of clear glass with painted details and yellow (silver) stain depicting an angel musician. English, c.1420-40. Removed from the now-demolished Hardwick House in Suffolk in 1924, together with the roundel of St Edmund alongside. Known to have been in Hardwick Hall near Bury St Edmunds, Suffolk.